He was just making sure, in all those queries, that I was nearby, and I figured the “I love you” was the façade of a growing-up boy who didn’t want to announce outright that he was nervous when he lost track of where I was in relation to him. He doesn’t do that anymore, and, like most bits of my children’s growing up that fade until I suddenly realize they are gone, I don’t know when he stopped. It seems to happen in fits and starts, this growing up process. One day I’ll look at my son, and he seems abruptly three inches taller, or my daughter’s face appears unexpectedly mature and I wonder where my little girl has gone, or the littlest one decides she doesn’t need me to walk her into the classroom each morning. Now my son, who once needed to know where I was at all times, wanders confidently through his familiar domain. He goes on regular solo expeditions, wandering far into the fields beyond the yard, although he often convinces the dog to keep him company. 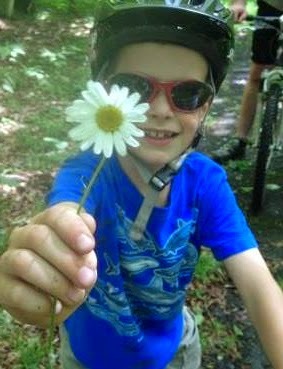 He has even ridden his bike to his grandparents’ house around the corner without me realizing it until he appeared again at my side and I thought to wonder where he’d been. At social gatherings and school events, all three of my children are now generally comfortable running off to play with friends. Some children, I’m convinced, do that from the first moment they are independently mobile, scampering out of their parents’ grasp as quickly as possible. Not mine. It seems just a week or two ago they were constantly hovering at my side, and I was endlessly trying to shoo them away to play and leave me with a few inches – and a few welcome moments – of personal space. As I’ve watched my children gradually gain independence, I’ve come to appreciate both the freedom to move and converse without a child or three clinging to my leg and the moments when they come back to sit with me. I used to be able to hold all three at once to read stories; now, when one of my children climbs onto my lap, it is all long legs and pointy elbows until they settle in. But the settling in is as sweet as ever. They are, all three, still young enough that when we are walking somewhere – down the driveway, through the woods, along a sidewalk – someone (or two) will hold my hand. There was a time not so long ago that I took walks close to home with a baby strapped to my chest and a toddler gripping each hand. Now, hand-holding has become a test of how fast they’re growing up. As we walk together, I often put my hand out and spread my fingers, holding my breath as I wait to see what will happen. Thankfully, my hand is filled each time, still, with a smaller one to hold. For that I am grateful, and will be for as long as it lasts, this hand-holding and couch-snuggling and bedtime-story-reading. Sometimes it seems I am the one who needs to be reassured of my children’s closeness. I am the one calling out to make sure they are still within shouting distance. I am the one seeking spontaneous hugs, sneaking in an extra squeeze, trying to store up all that closeness in my heart for the inevitable day when I will reach out my hand and they will be too grown up to hold it. At ages 7 and 5, my children are at a magical stage where self-reliance and proud independence coalesce with the lingering attitude that Mama is pretty cool. They will entertain themselves happily for hours (except for the times when they’re harassing each other, but let’s focus on the good moments here). They are super fun skiing, mountain biking, and soccer-playing companions. They get themselves dressed in the morning, get their own snacks, brush their own teeth, and put their own laundry away. In short, I no longer have to do everything for them, but they still, usually, like having me around. I have often heard my own mother say that a parent’s role is to foster in her children both roots and wings: a sense of place, of home, but also the confidence, skill, and knowledge to take off and fly to new heights, new places, new experiences. I am already slightly terrified that my children will fly away some day, as I did once. But I want them to be ready for that day when it comes. And I want them to know where home is, too, that when they need me, I’ll be here. My son still calls to me regularly from the other room or across the yard or down the stairs. Only now, when he calls, it is often, “Mom?” instead of, “Mama?” And it is generally followed up with a question about something (“Where are my soccer cleats?”) or to share some glimmer of newly acquired knowledge (“Did you know that kinkajous are nocturnal?”) or seeking permission (“I’m going outside, OK?”). As I answer each of his queries, I add my own, “I love you.” And still, thank goodness, the reply comes, “I love you, too, Mom!” as he bounds off into the world. Original content by Meghan McCarthy McPhaul, posted to her Blog: Writings From a Full Life. This essay also appears as Meghan's Close to Home column in the October 24, 2014 edition of the Littleton Record. On one of those beautiful fall days we had in that lovely stretch from September into the first bright days of October, with sunshine streaming through colored leaves and temperatures warm enough for t-shirts, my youngest daughter grabbed a rake and started making a leaf pile. In her sixth autumn, she already knows one of the best fall activities is leaf leaping, and for that you need a good pile of leaves. Any type of leaves will do, really, but the bigger the pile, the better the fun. By the time her brother and sister came home from school, that first leaf pile of fall was of sufficient width and depth for jumping, which the children set gleefully to doing. A running start is paramount for the best landing. Run. Jump. Giggle. Sometimes they’d intersperse that sequence with a good roll through the leaves or a few minutes lying still in the pile, completely covered, silent until some unassuming being – the dog, a sister, Grandpa – happened by and the hidden child would jump out to starling effect. I can’t figure out the allure of jumping into leaves. I did it when I was a kid, too – it’s a beloved fall tradition for kids growing up wherever there are trees to drop leaves to rake into piles. 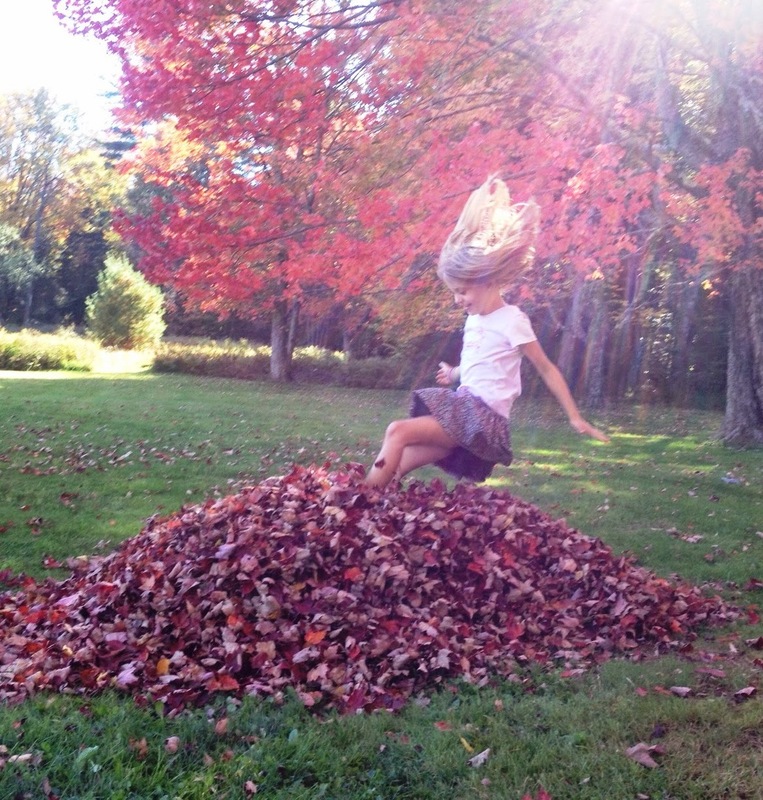 But as I watched my children for several successive afternoons jump joyfully into leaf piles – often with hard landings, always with plenty of crunch, and ending up with leaf particles mashed into hair and clothes – I couldn’t remember why, exactly, that activity is so much fun. Whatever the appeal, my children remained jubilant in their leaf leaping. As the week went on, the trees dropped more leaves, and the kids and I kept on raking until the piles were nearly as tall as the children. Orange and yellow maple leaves joined the red ones that had started the pile. These were interspersed with smaller golden birch leaves and not-as-pretty, brownish apple leaves. Each leap and landing released a colorful confetti of leaves swirling into the amber light of an autumn afternoon. Rake in hand, I’d fluff the pile after every jump, prepping for the next leaping turn. I even took a leap. Alas, while I strive to embrace my children’s wonder of life, I think I’m too far beyond the magic of childhood to get that leaf-leaping thrill now. In motherhood, at least for this activity, I’ve been relegated to spectator and pile fluffer. One afternoon we invited a few friends (and their spectating, pile-fluffing moms) to join in the leaf-leaping fun. By now, we had four huge piles of various autumnal hues. The children – nine of them, ranging in age from 2 years to 8 – gravitated to the largest pile, a colossal heap of orange maple leaves and yellow birch. Some of the kids jumped right in. A couple surveyed the scene first, mentally weighing the possibility of a hard landing against the potential for pure fun. In the end, fun reigned. Not content with mere jumping, the kids threw leaves by kaleidoscopic armfuls into the air and laughed as the wind carried them into friends, siblings, moms. Little feet kicked big steps joyfully through the crunchy piles. Occasionally, someone would lie back for a moment, looking up through the leaves still hanging from branches overhead to clouds skittering in white puffs across a blue sky. After an hour or two of kicking, tossing, and jumping, the biggest pile had been diminished in heft by at least half, the leaves now thoroughly mulched and loftless. The children moved on to the other piles, happily scattering leaves hither and yon. The next day, our calm and sunny fall changed, as Autumn found its bluster. The wind knocked down the remaining maple and birch leaves. Rain soaked the shrunken piles, which would soon be picked up and hauled away to the compost. Prime leaf-leaping season, at least in our yard, blew away on a gust of wind, leaving the song of children’s laughter in its wake, and a few leaves still dancing on the breeze. Original content by Meghan McCarthy McPhaul, posted to her Blog: Writings From a Full Life. This essay also appears as Meghan's Close to Home column in the October 10, 2014 edition of the Littleton Record.